Two posts in a row about waterway transport – I’m obsessed! Not completely, but I just gathered word that the New York City Economic Development Corporation is planning five new routes for the citywide ferry service, one of which will connect Red Hook to Brooklyn Bridge Park, DUMBO, Bay Ridge, the Brooklyn Army Terminal, and potentially Governors Island. Set to launch in 2017, the ferry will bring commuters to Pier 6 in Brooklyn Bridge Park in just 10 minutes, down from the current 20-minute bus ride. This is kind of huge, considering that Red Hook has too-long been underserved by public transportation. Ferry rides will be $2.75 per route (same as subway fare) with free transfer between ferries available. Cooperation between the East River Ferry and MTA is unclear so far: While there isn’t free transfer available (yet) between the ferries and subways or buses (similar to the free transfer between the B61/B57 and a subway), there are murmurs of the ferry currency of the future being compatible with that of MTA, as the latter is now undergoing a redesign. All of this information was made available to me at the most recent Community Board 6 Transportation Committee meeting where NYCEDC representatives shared the plan and its timeline and site designs, along with reasoning for its landing and route decisions. They made decisions based on current transportation options in communities, density of residents, and potential for neighborhood growth. 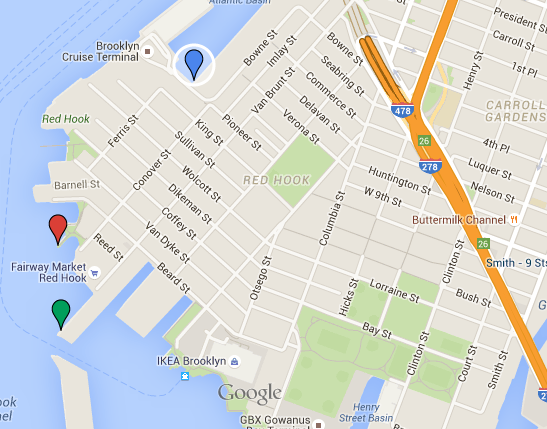 NYCEDC is exploring two landing options in Red Hook: one at the end of Van Brunt Street and the other Valentino Pier. Red Hook residents voiced their concerns about the potential landings for the ferry service in Red Hook; they specifically addressed landing access and view obstruction. The end of Van Brunt is far – from residents, from businesses, and from any connecting bus stops or subway stations. The Valentino Pier, while also far away, is historic and gives Brooklyn some of the best views of Governors Island and Lady Liberty. So, neither location is ideal, which is why residents are backing a landing in the Atlantic Basin; however, NYCEDC is resisting because of the delay it would cause commuters, as entering in and out of the basin requires the large ferry to slow down, turn around, and approach the landing with caution. It doesn’t make sense with this commuter-based service that will be in competition with land services like buses and subways. But, residents argue the Atlantic Basin is more accessible to the whole Red Hook community, especially those that reside in the Red Hook Houses. Below is a map of the potential landings. Green is Van Brunt, red is Valentino Pier, and blue is Atlantic Basin. 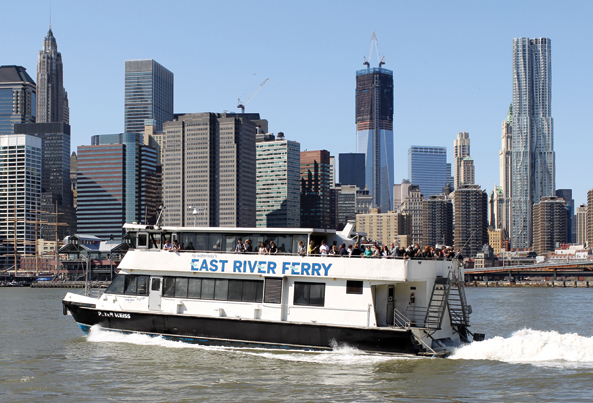 There was a somewhat mild crossfire between Red Hook residents and representatives from NYCEDC at the meeting – but people are, in general, excited about the fact that the ferry is coming to Red Hook. It can carry more passengers than the Water Taxi (150, potentially more), it goes to more stops than Pier 11, and it costs the same as a subway ride. More pros than cons, but some kinks to iron out here.